12-digit printing calculator offers simplicity, portability and convenience wherever your work takes you. Two-color ink prints positive numbers in blue, and negative numbers in red to prevent you from making costly reading errors. Double-check function helps minimize miscalculations for more accurate results. Clock and calendar function enables you to view the time and date with a quick glance. 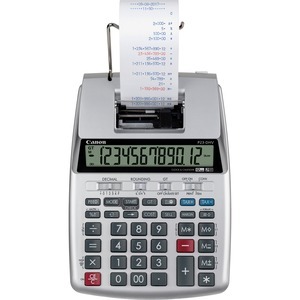 Printing calculator also includes tax calculation, currency conversion, various decimal positions, sign change and more.